A microwave is one of the most versatile tools in your kitchen and for a lot of people, it’s actually the most important tool in the kitchen. Having a good quality microwave, however, is important. 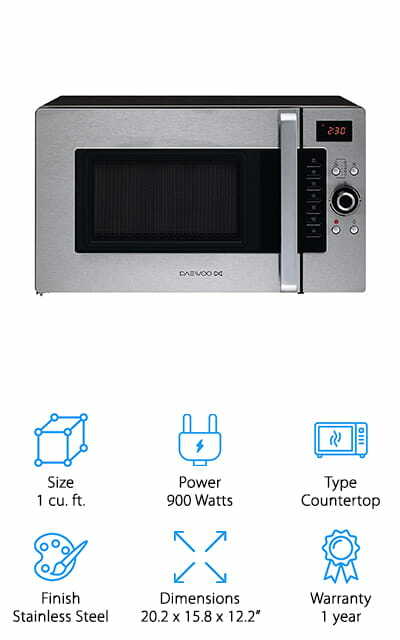 With this convection microwave oven buying guide and convection microwave oven reviews, hopefully, you’ll be able to find the best possible microwave. Make sure you take a look at each of these features to help you make that decision. Size: How many cubic feet is the inside of the microwave? This is going to tell you how much it’s able to hold. You want to make sure you can easily cook anything you want inside of it. Make sure you don’t get something too large, however. Power: How much power does it have? This is where you want to find out about watts because the more power it has the faster it can heat or cook whatever you may need. Too much power can be problematic too. 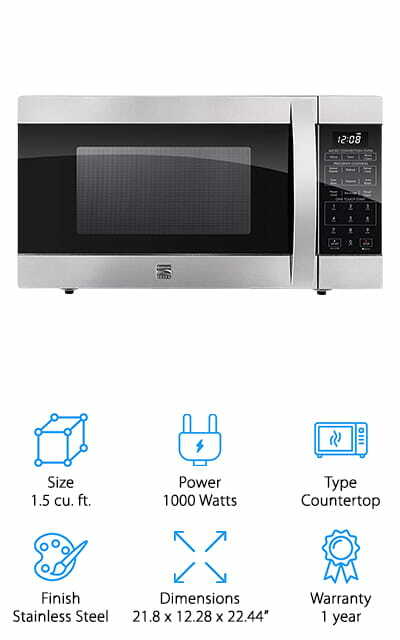 Type: Is it a countertop microwave or an over the range one? You need something that fits where you have the space and these two methods are not going to work for the opposite area. You need the right venting, after all. Finish: What does the microwave look like on the outside? Does it have a black coating or a stainless steel one or some combination? Maybe it has something else entirely. This is going to be about personal preference. Dimensions: What is the actual size of the microwave? You want to make sure that you have the space for it, after all. Whether it’s going on the countertop or over your oven you need the right amount of room. Warranty: A good warranty means that you’re getting something high quality. After all, a company isn’t going to give you a warranty that it thinks the product won’t surpass. If you get several years it means the product should last. Getting a microwave oven is pretty easy, but getting the best option can be really difficult. There are so many that figuring out exactly what you want or need will take some time. Luckily for you, we’ve done the hard work for you and we’ve created some great convection microwave oven reviews that will help you get a head start. All you need to do is go through these to find the right option. This 1.1 cubic foot convection microwave is a countertop design, which means you’ll need some space on your counter to set it up, but it’s definitely our best convection microwave oven for a reason. It has a ceramic enamel interior and a black stainless steel exterior that make it easy to clean as well as sleek on your counter. Moderately priced it has 1300 watts of cooking power and an interior fan to help evenly distribute the heat. Not only that but it can toast, crisp and brown as well as simple reheating, so you get better food than ever. One unique feature with this microwave is that it actually opens downward instead of on the side, so you can get into it even easier when you’re ready to make your next dish. With several presets already programmed and a knob to dial your time, it’s a simple to use product. 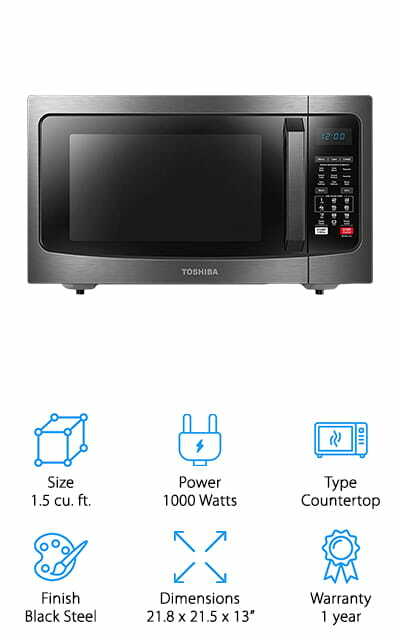 Our budget pick is a Toshiba microwave that’s actually available in a black or traditional stainless steel to fit your household. 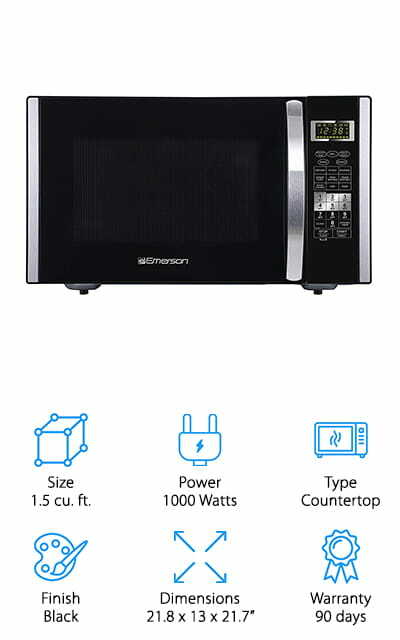 This best countertop convection microwave has a smart sensor and LED lighting and is actually 1.5 cubic feet in size. Great for roasting, baking and defrosting, it’s simple to clean on the inside and the outside. Even better, it needs very little clearance to make sure you’re getting the best possible heating and it provides plenty of space for cooking just about anything you might need. There are 6 presets already ready to go and there are more and fewer buttons that will let you decrease or increase the time as you cook. With an included grill rack, you can even set up to 3 of your own favorite settings for common meals. This best convection microwave is a countertop option that actually has plenty of features. It’s black with a stainless steel interior and accents and gives you 1.5 cubic feet of capacity, though there are 2 additional options available for size as well. It provides 1000 watts of power and has a grill feature with a removable grill rack that helps you brown food easily. With the convection function you can roast or bake foods and the 9 preset cooking functions make it even easier to get started cooking different things. There are actually 11 different power levels available and the whole thing runs on touch control. What’s really great is the lockout function that helps protect your children from turning the microwave on without meaning to. This microwave is a countertop option that has 1 cubic foot of space on the inside, enough for most home use. It also has options for healthy air frying and even grilling and convection oven use. 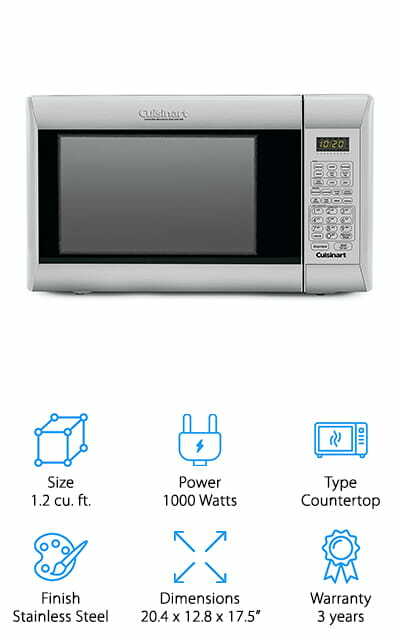 With 1000 watts of power for the microwave function, it gives you 10 power levels as well as multi-stage cooking. The glass door design and sensor touch control panel make it simple to change the settings and get the unit ready to go however you need it. A Teflon pan is included with the microwave to make it easier for you to air fry or grill and the interior LED lighting makes it easier to see what you’re doing at the same time. A child lock also makes it safer to have this unit sitting on your counters at home. This system provides you with a whole lot of features. It’s a 1000 watt unit with the ability to be built-in or sit on your counter. It also offers convection cooking and has sensor cooking controls. The 1.5 cubic foot capacity makes it a good option for most cooking uses and the removable tray provides you with even more versatility. There’s even a pan to help you cook. When you’re ready to set it up you won’t have to worry about the size because it fits easily under your cabinets. It also lets you actually crisp your food while you’re reheating it instead of having to simply reheat without the convection feature. 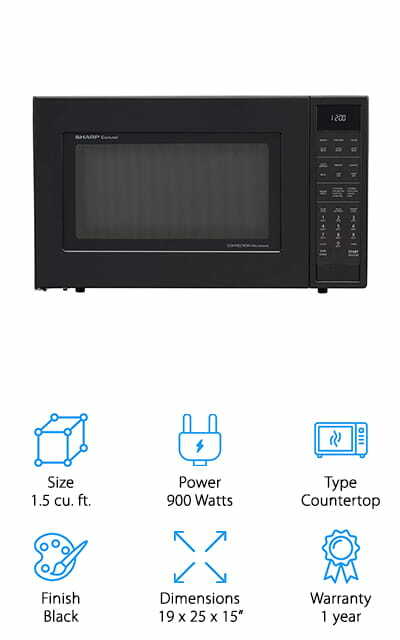 At 1.5 cubic feet of interior space, this 900 watt microwave oven is black in color to match the rest of your appliances. It has several presets ready for you so you can start cooking your favorite foods in no time at all and also has touch sensor buttons to help you set the right heating time for the rest of your food. You’ll even have the ability to set the temperature for the convection oven settings on the microwave itself. 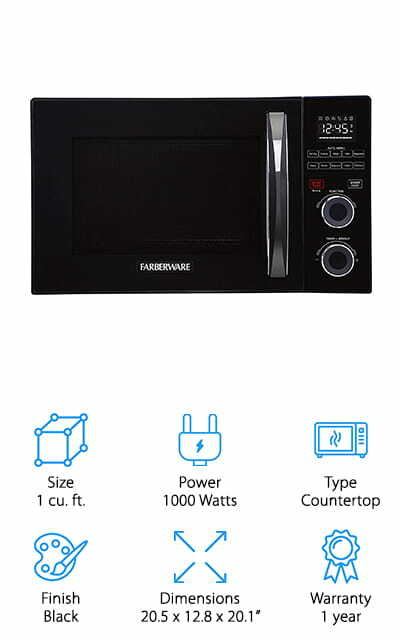 Use this microwave oven for roasting, baking and even browning as well as simple reheating so you can have great tasting food the first time and the second time. It even has a cook sensor to help determine the right cooking and reheating times and power levels. 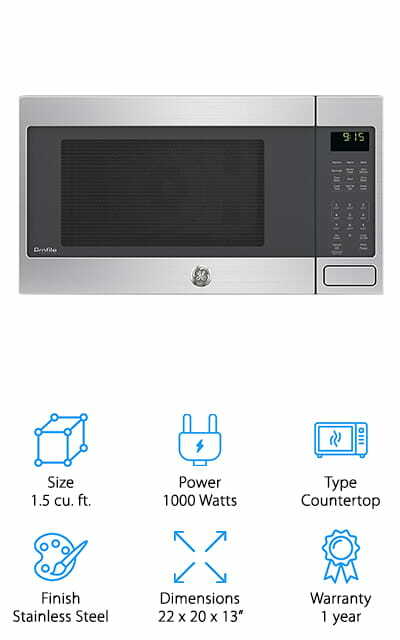 This microwave is actually 1.2 cubic feet, though there is a 1 cubic foot option available as well, and comes in a brushed stainless steel. That means it looks sleek on your counter but also is less susceptible to fingerprints and stains. Simple to sanitize, it doesn’t absorb odors and even has a 12” tray inside. There’s also a reversible grill rack and touchpad controls that use LCD. You’ll have the option to defrost food by weight or time and you’ll even have the ability to bake or roast food through the convection system with or without the microwave. BPA free, you’ll have a 3 year warranty and a simple to use a system that will make heating and cooking your food a whole lot easier. Because it uses a multi-stage cooking process it actually switches between cooking methods automatically as well. This Kenmore microwave oven has 1.5 cubic feet of space and comes in stainless steel with black accents. That means you’ll have no problem getting a great look for your kitchen and you’ll be able to get all of the functions that you’re looking for. 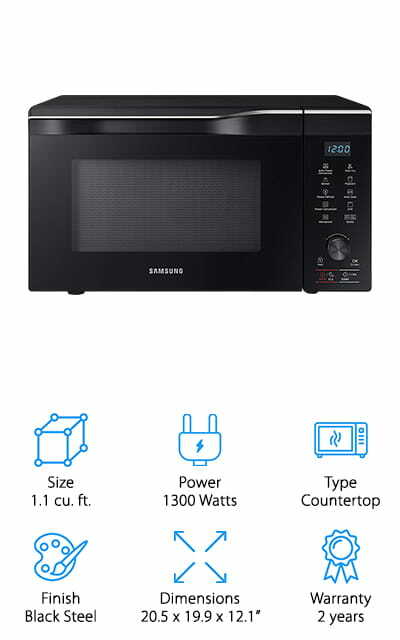 The buttons are all operated based on sensors and you’ll have several presets, including the option to use the microwave or convection separately or together. On top of that, you can set the temperature or the time that you’re looking to use and get great results. The 1000 watts of power mean that this is a great option for most home uses and allows you more versatility in anything you’re looking to make. It’s also easy to clean on the inside because of the stainless steel and has a glass tray built in. This inexpensive option is 1 cubic foot and 900 watts and features a stainless steel exterior with black accents. It uses a concave reflex system to give you great heating and it has 10 different power levels. The power lets you cook a range of different products without having to worry about crispness or browning. There are even an easy clean function and an auto cooling function that help you get a great clean whenever your microwave needs it. To keep your family safe there’s also a child safety lock that makes sure the microwave can’t be turned on by accident. The dial system makes it simple to get the settings you’re looking for and get to eating your great food. 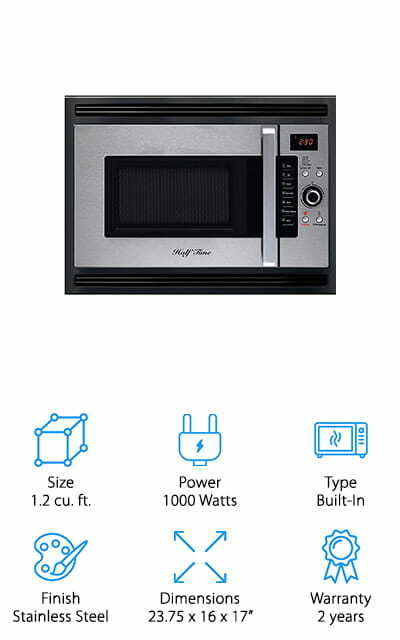 This 1000 watt microwave is actually able to cook up to 50% faster than your gas or electric oven and gives you the option of baking as well as reheating foods but in a much better way. It features a built in base and a cooling fan as well as a trim kit to allow it to be built right into the wall. There are actually 3 different ways you can install it by putting it in with a gas cooktop, into a wall cabinet or under a countertop. No matter what, you’ll have a great way to heat and cook your food. You actually get bake, brown and roast options to go along with the microwave function. Top it all off with the stainless steel and black style and you’ve got a great looking unit that can get just about anything done in no time.